Dr. Nilam Bansal received her Bachelor of Science degree in Molecular and Cellular Biology from the University of Arizona. She earned her Doctor of Optometry degree from the University of Houston in 2011. Her externships consisted of the Albuquerque Veteran Affairs in New Mexico and a private practice specializing in contacts in Austin Texas. She is an active member of the American Optometric Association and the California Optometric Association and is currently an office member of the local optometry society. 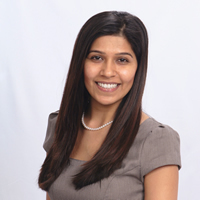 Dr. Bansal is therapeutic and glaucoma certified and enjoys full scope optometry with an emphasis on ocular disease and contact lenses. Being new to the area, she loves exploring the Bay Area with her husband and enjoys cooking and volunteering. Being very passionate about helping others, she consistently volunteers in the states and third world countries.